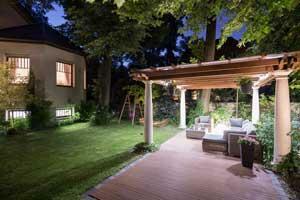 Want to brighten your night with outdoor lighting? The nights in Phoenix are often warm; enough that staying out late without a jacket isn't entirely uncommon. But on those warm summer nights, you can't do much if you can't see. 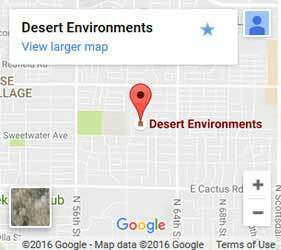 That's why Desert Environments does custom outdoor lighting, to give you that ideal backyard lighting that's a perfect combination of light and shadow. You shouldn't have to stand out in the dark and barely be able to see your yard or the person beside you, and you don't have to! Up lighting or down lighting plants depending on their height and location can make them shine. We'll point a light upwards towards it or down from above to show off its best features! Shadow casting can add shapes to objects. Just like putting your hand in front of a projector, you can artfully use shadows to create silhouettes at your home too! Path lighting is not only is this a good idea for safety reasons, but adding lights to your landscaped areas can also give structure and guidance to your walking area. Submerged lights are a fantastic choice for water features and pools to provide brilliant water colors or to better bring forth the same natural colors as in daylight. Need help with backdoor lighting design? Let us take a look for you! As experienced exterior lighting experts, our qualified landscape designers can give you ideas on how to improve your property. Sometimes, a few well-placed lights can make all the difference. Adding a couple of garden lights, hanging lights, or outdoor lamps in your style can give you the look you've always hoped for. You tell us what you like, and we'll help make it happen. 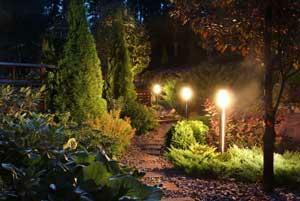 Call or contact us today for outdoor lighting! We'll even give you a consultation with some ideas on what we think would work best for your property--completely free!